First of all, I would like to extend a big hug to everyone who reached out, either publicly or privately, to offer advice, share links, or otherwise advise on my efforts to find casual but stylish weekend summer wear. Given the level of response, I feel it’s only appropriate to provide an update. Based on a recommendation from my friend Erika, I checked out Madewell, the casual sister company to J. Crew. 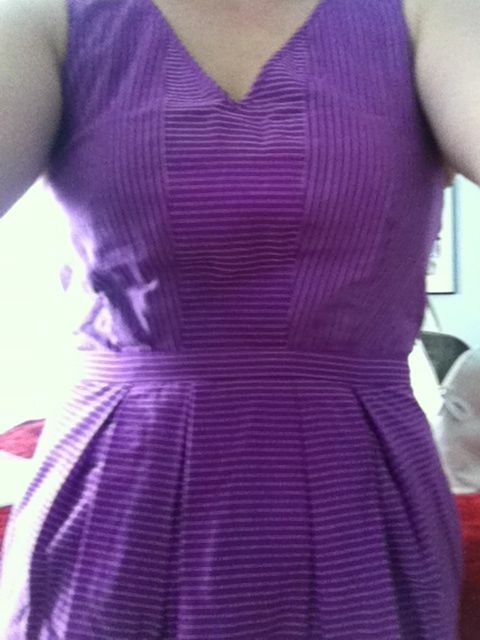 I ended up buying their beachhouse dress in fuchsia (pictured). One concern about this dress is how many ice cubes would be dropped down the cut-out detail in the back, which (sorry) I found impossible to photograph for you without my back looking fat. While I like the idea of a mustard colored patent leather skinny belt around the waist, I don’t love the dress enough to keep it for the price. Back it will go. This week, J. Crew kindly sent me a notice that more items had been added to their summer sale. Lured back to their website by my second favorite four-letter word, I bought the Driftwood dress (I know, this has a dreaded elastic waist, but I envision belting it) and the Elinor dress. I think (hope) one or both of these dresses will help fill the causal weekend outings wardrobe gap. I spent time time cruising the likes of Anthropologie and Modcloth but didn’t find anything that fit the bill. (I found a lot of items that didn’t fit the bill, of course.) Lilla P has some cute dresses but the price point is more than I want to spend on casual attire. Thus, the hunt continues. I’m determined to stay laser focused until I have filled my closet with seasonably appropriate weekend attire. And then we can talk about shoes again.